Constantine the Roman Emperor from 324 to 337 decided to found a new Rome, and in 324 AD he moved the capital to the East, to the Greek city Byzantium on the Bosporus. He named the city Constantinople after himself. The empire was still Rome, though, and the inhabitants called themselves Romans or Romei in Greek. Constantine inaugurated the fortified city of Constantinople on the site of Byzantium on the Bosporos in 330. Soon called New Rome, the city became capital of the Roman world after the fall of 'old Rome' in 476. The modern name for this empire is 'Byzantine', after the city it superseded, but it described itself, in Greek, as Empire of the Romans or Romania . After the reforms of Constantine, the Greek East gradually evolved into a separate political and cultural entity with Greek as its main language and Latin an official entirely replaced Latin as the language of law and administration. There was a close relationship between the emperor and the church, and it was during the Byzantine period that many standards were set for the Orthodox Church. Most land was owned by the emperor and the church, and the empires major economical factor was agriculture but also trade. In the 5th and 6th century the Byzantine armies had to fight both the invading Huns and Goths, but managed to secure the Empire. Of the most famous Byzantine rulers was Justinian I and his wife Theodora. They wanted to restore the Roman empire in all aspects, including the geographical borders and intellectual spheres. 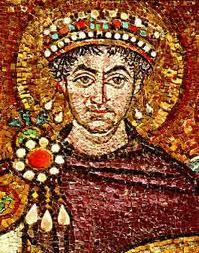 For 31 years, starting in 534, Justinian took back North Africa, Italy, Sicily, Sardinia and parts of Spain. This, of course, put great strain on the empire, plus the fact that many public buildings such as the Hagia Sofia were built, and plagues were tormenting the people. The reign of Justinian marked the end of an era of confidence and expansion. Plague decimated the population of Byzantium, Slays overran the Balkans, Lombards captured Italy, Persians invaded from the east. The rise of Islam in the seventh century changed the power profile of the Middle East, and Egypt, the Holy Land and Syria moved out of the sphere of Byzantine influence. Byzantium suffered invasions from the Germanic Lombards and Turkish Avars, and during the 7th century huge areas of the Balkans had been lost to the Turks and the Slavs. The Emperor Maurice was assassinated in 602 after twenty years of rule, and this led to both civil war and war with external factors. In 610 Heracilus came to the throne, and he managed to defeat the Persians in 628 after years of wars. Although this was an important victory, returning Syria, Palestine and Egypt to Byzantium, the Empire was seriously weakened. Internally it suffered conflicts between different Christian fractions, and together with the weakened economy after so many wars, the Byzantine empire was to suffer many setbacks from the invading Arabs. The Arabs were now Muslim, and the new religion had given them inspiration to expand, and they took large parts of the Byzantine empire, including Palestine, Syria, Egypt, Mesopotamia and large parts of Asia Minor. The Byzantine armies were reorganized in order to control the empires financial doings, with one general per district that would control his area. The infrastructure was losing ground fast, and almost everywhere the commercial market degenerated. Education and agriculture declined, and people left the cities. Sometime around 730 the iconoclastic dispute started when Leo III forbade the use of icons in worship. This conflict was to go on for a span of a century, and set many rules for art in Orthodox Christianity. The Byzantine empire was to regain strength from the 9th to the 11th century, getting back areas in Asia Minor as well as in Greece and Macedonia. Basil I was the founder of the Macedonian dynasty, which was to rule in Byzantium for 214 years. The dynasty strengthened the empire, and gave emphasis to classical Greek aspects of Art and Literature. Unfortunately, the empire's land was gradually coming into the exclusive hands of a few noble families and the church. Basil II both expanded the empire and crushed a Bulgarian rebellion, but did not manage to do anything about the way the land was distributed. Byzantium continued to grow economically even after he died, but the internal development was obstructed by the new emperors neglect of new technologies and economical developments that happened around the empire, both in Europe and Turkey, and the Byzantine army was getting weaker. From the Turkish victory at the Battle of Manzikert on, the Byzantine empire was to lose ground totally. The Turks conquered more and more of the empire, and the West distanced itself because of the Christian schism of 1054 resulting in the western church becoming the Catholic and the Eastern the Orthodox. The continuous Turkish invasions forced the emperor Alexius I Comnemus to beg the Pope for help, and the First Crusade was set in 1096 against the Turks. This seemed at first to help, but when the Italian merchant cities got special privileges, they slowly took control of the Byzantine commerce. Even though the empire was coming up a little bit during these times, the benefit mainly came to the Venetians and crusaders. Constantinople was sacked by the crusaders in 1204 during the Fourth Crusade. A Latin Empire of the East was established, only to fall when the Byzantine emperor Michael VIII Palaeologus seized power in 1261. The Palaeologan house was to rule for almost 200 years, but the empire was basically on the verge of total bankruptcy by this time. The Ottoman Turks invaded parts of the empire, and in 1453 they conquered Constantinople, thus ending what we call the Byzantine period. Byzantine superiority brought about the emulation, appropriation and rivalry of neighbouring societies. The Byzantine tradition was copied in Moscow, suiting its claim to be the Third Rome after 1453. The emerging kingdoms in the Balkans copied Byzantine art and ceremonial. The eastern Orthodox churches showed their kinship with Byzantium by accepting its pictorial conventions, while the non-Orthodox churches of the East were profoundly influenced by Byzantium, but developed their own identity by subtle changes of style and subjects. One of the most successful artists from Armenia was Toros Roslin, who combined pictorial elements from Byzantium, Armenia and the West into his own original national style . The luxury of the court is revealed in its treasures, sometimes deeply spiritual in their subjects, like the ivory triptychs, sometimes subversive in their parodies of pagan images, like the Veroli casket, and sometimes imperious in their expression of power, like the Troyes casket. The atmosphere of fear and crisis saw the growing popularity of devotional icons, the emergence of miraculous icons not made by human hands' and the appearance of the face of Christ on gold coins. All these developments were halted in 730 when Leo III (717-41) passed an edict banning the use of images showing Christ, Mary or the saints. Such images were mutilated or whitewashed. Iconoclasm was maintained (with an intermission from 787 to 814) until its final collapse in 843. Many explanations are offered for the outbreak of iconoclasm. Some argue that it was a religious reaction against the 'superstitious' faith in icons, prompted by fear of divine retribution for Byzantine idolatry; others that it was a political reaction to the growing power of the Church and monasteries, and an attempt to re-establish imperial control. Following the failure of iconoclasm the Triumph of Orthodoxy was celebrated in pictures and with an explosion of artistic activity. Orthodoxy was declared to be the use of icons and icons declared the nature of Orthodoxy. Dwellings in cities tended to be poorly constructed with small, mean rooms, the living quarters upstairs. Houses in the country were generally equally humble, although wealthy landowners in town and country would have inhabited grander homes with painted walls and the best furniture. Domestic possessions are best known today through grave goods, preserved in Egypt and including clothes, shoes and figurines, andthrough buried hoards, like the Traprain hoard found near Edinburgh and the Krategos Treasure from Mytilene. The wealthy used silver dishes and spoons,decorated with Christianbut also pagan mythological subjects, clay pottery for normal household use and dining has also been found dating from throughout the period. Some domestic vessels were decorated with Christian subjects, but ceramics, which were made all around the empire, gave the opportunity for more frivolous designs, such as floral motifs, birds, animals and figures. Both men and women wore ostentatious golden body adornments such as bracelets, torques, earrings, necklaces and breast chains. Early Byzantine churches had a low chancel barrier between the laity and the open altar. By the date of the church at Skripou (873/74), a higher templon screen with an epistyle supported on columns made the sanctuary more separate (cat.183). By the twelfth century, these templon screens were adorned with icons, and by the fourteenth the screen had become the high iconostasis, clothed with icons, and the altar behind it a place of greater mystery. Processions with crosses, icons, ornamented Gospel-books and portable textiles were a feature of the Church's year. Services were long, the liturgy dramatic and the atmosphere full of incense. The climax was Easter, when the Crucifixion of Christ on Good Friday and his Resurrection on Easter Sunday were symbolically commemorated. 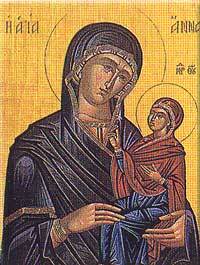 achievement of Byzantine art is often identified as the painted-panel icon. Before the twelfth century virtually no icon-painters names are recorded. Even with the appearance of artists' signatures on icons, particularly in the fourteenth and fifteenth centuries, little emerges about their personalities. The best-known artist is Angelos Akotantos of Crete, who signed several icons 'By the hand of Angelos'. Icons were donated to churches 'for the remission of sins' and they could be enhanced, as in the case of those from Ohrid , with semi-precious stones and metal revetments. A very few, highly precious icons were made in micromosaic , and were prized and collected in Italy. Multiple copies were produced of miraculous icons, such as the Virgin Hodegetria (cat.236), legendarily painted by St Luke, as the powers of the original were believed to pass to copies. The view of the priority of the Greek East over the Latin West in the development of early European art and culture is now seen as an oversimplification. The statement of Giorgio Vasari (1511-1574) in his Life of Cimabue that 'although Cimabue imitated those Greek artists who came to Florence, he vastly improved the art of painting and raised it far above their level', is equally debatable. East and West were continually in contactand learnt from each other. Artists and diplomatic gifts moved back and forth, and Western church treasuries received such precious donations as reliquaries of the True Cross and silk garments. Byzantine artists worked in Italy, notably at Venice, Torcello (cat.254) and in Norman Sicily, and on the bronze doors of South Italy (cat.265). Western artists worked for Crusader patrons in the East. Relations between East and West soured after the Sack of Constantinople by the armies of the Fourth Crusade in 1204 and the subsequent removal to the West of many treasures and relics. The Byzantines returned to Constantinople in 1261. The churches of Rome and Constantinople had officially been in schism since 1054 and remained so, despite the optimistic attempts of churchmen like Cardinal Bessarion to achieve the Union of the Churches at the Council of Ferrara-Florence in 1439. 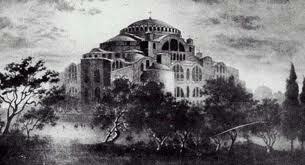 Although the art of Byzantium was influenced by the West, it succeeded in maintaining its own traditions and aesthetic.